Wikimedia Tunisia is an emerging community that intends to organize Wikimania 2015 in Monastir, one of the best tourist destinations in Northern Africa. Set along a superb coastline with a blue sea and long golden sandy beaches, Monastir is a pleasant seaside resort as well as historical town full of traditions. Monastir out under the protection of its ribat, one of the most impressive fortresses of Tunisia, its medina, its fishing port, its marina and its background of villages and orchards make it a lively and welcoming destination. “Very generous and welcoming people” says anyone who has been in Tunisia. A country that has recently awakened, that has inspired many other countries and that gave young people the opportunity to shape a new identity for their country. After the revolution of January 2011, Tunisia has opened a new chapter in its history. The post-revolution Tunisia has a different taste, people are free to act and to express. Everyone is trying in his own way to build this country that is rich in natural beauty and in its history. Since words need to be put into actions, we submitted our candidature for organizing Wikimania 2015 in Tunisia (Monastir). Other rooms used for various purposes (A "Braille" room , a virtual university room, a digital studio, a language lab, a library and a digital crossroad). The faculty of dental medicine consists of two amphitheaters with 200 seats that will be used for workshops. The faculty of pharmacy consists of three amphitheaters with 150, 200, and 250 seats respectively that will also be used for workshops. In total, we have a big auditorium, 1 conference room and 5 amphitheaters. All these spaces are equipped with wifi hot-spots. The faculties of dental medicine and pharmacy are very close. A map and clear instructions on the streets will be set to guide visitors. Welcome to Monastir where you will have your fill of blue sky and sunshine, where you will find extraordinary heritage and original traditions, where you will enjoy twinkling sea. Monastir is a tourist city on the eastern coast of Tunisia. It has many fine hotels and restaurants. It has also many faculties part of the University of Monastir. "Modern Monastir extends beyond the old town and along the coast. It is full of hotels and tourist amenities, making it a modern seaside resort." "Coloured boats on a beach of very fine sand, and then the sea, its colour growing gradually darker, from the almost white azure at the water's edge to dark blue towards the horizon. The image of relaxing, holidays and carefree existence is just one the many that Monastir has in store for the tourist." In 2004, the population of the municipality is 71,546 inhabitants. Monastir enjoys a dry Mediterranean climate with hot summers, extremely mild winters, lots of sunshine and low rainfall year round. The city sits in the northeast of Tunisia, on its central coast. It is much hotter than the Mediterranean resorts on the European coast, but much milder than inland areas of Tunisia, forty percent of which is part of the Sahara. Summer, from June till September, is absolutely sweltering. If you spend too long outside, you’ll find yourself melted to the spot or wilting in the shade. While humidity is low, the soaring heat can still be hard to handle. The average high temperature of 29°C in June skips past the 30°C mark in the middle of the month and climbs up to 33°C in July and August. Tunisians are willing to learn foreign languages. Tourists usually don't find problems communicating with Tunisians. Arabic is the native language. French is spoken fluently by almost every Tunisian and is often used in many fields (press, radios and all road signs). English is the third spoken language in Tunisia and it's well spoken, especially in touristic areas. Appreciated by tasters, Tunisian cuisine owes its variety to the richness of its soil and the contributions of different traditions: Berber, Arab, Turkish and even Italian... Tunisian people love a good taste and give much attention to what they eat. Welcome to a tasty world full of colors and savory surprises! A sunny cuisine where lamb mixes with sea bream and grouper, where almonds blend with peppers and rosebuds, and where olive oil is combined with carefully selected spices. The celebrated couscous can be cooked in countless different ways: with fish, dried meat, meatballs, stuffed squid... A crispy hors-d'oeuvre and delicious almond patisseries are made from filo pastry, bequeathed by Turks. The meal is accompanied with the traditional mint tea accompanied by sweets. Restaurants are classed as "touristic restaurants" with a rating of 1 to 3 forks. Monastir's star attraction is its preserved ribat complex, considered as the country's finest example of Islamic military architecture. Its seemingly chaotic design with labyrinthine passageways and staircases is a legacy of the ribat's many periods of construction and renovation. The consequence is an evocative structure devoid of any uniformity. The original ribat occupied only the central courtyard and museum area and was built in AD 796. The current shape was established by the Aghlabids at the end of the 9th century and completed during the 11th century. The ribat of Monastir is erected by the wali Harthama Ben Ayan on an order of the Abbasid caliph Harun al-Rashid in 796, to serve as a defense against attacks of the Byzantine fleet on the Mediterranean Sea. It represents, with the ribat of Sousse, one of the two most important of the Sahel coast fortresses. There are panoramic views of the town and the coast line from the ramparts. "One of the monuments that is symbol of the town, the spectacular ribat, facing the sea and strongly fortified, with battlements, turrets and a central tower from the top of which you can enjoy a wide, enchanting view of the sea, the medina, the mosques and the mausoleum of Habib Bourguiba. 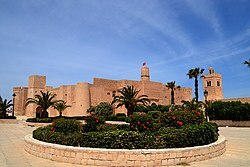 Because of its great beauty, the Monastir ribat has been chosen as the set for many film productions, including Franco Zeffirelli's Jesus of Nazareth. Its construction goes back to 796, which is why it's considered to be the oldest Arab fortification in Tunisia." Monastir's medina was largely demolished after independence in an ill-considered rush to modernise the town and keeping with its status as the birthplace of the president. Thankfully, the ribat survived, as did the Great Mosque. Built in the 9th century, it's a severe Aghlabid creation, apart from the graceful horseshoe arches at the northern end. Roman columns supporting these arches and thoe of the prayer hall (closed to non-Muslims) were salvaged from the ruins of ancient Ruspina. The walls in the western part of the medina remain largely intact and are the dotted with some interesting old gates, the finest one is Bab el-Gharbi, at the centre of the western wall. It was built by the Hafsids during the 15th century. Bab Tunis, at the northwestern corner, was built in 1780 while the main southern gate, Bab Briqcha, was built by the Ottomans at the end of the 17th century. The Costumes Museum is around the corner from the tourist office and worth a quick look. The visitors to Monastir should not leave without visiting the mausoleum of Habib Bourguiba and his family. The mausoleum could be reached via a paved walkway, the gold and green cupolas are very attractive for new comers. The marble courtyard, green-tiled arches and elegant eastern doors are superb. The mausoleum houses tombs of the family and a small display of items that belonged to the first president of Tunisia. The admission is free of charge and it is open Mondays to Saturdays. If the main gate is occasionally closed, visitors can walk around the fence to the next small gate on the northern side. "Monastir's other, spectacular symbol is the Mausoleum of Habib Bourguiba, statesman and father of Tunisian independence, who was born in this town on 3 August 1902 and has been buried here since April 2000. The great monument is laid out as a central building covered with a large gilt dome, containing Bourguiba's tomb, surrounded by three other green domes, where the president's father, mother and first wife are buried. At the sides, there are 25-meter high minarets topped with gilt spires and the whole structure is covered in precious marble." The old symbolic port has an excellent location and panoramic views. The marina and its modern installations offer to the admiring looks its enormous yachts, floating and slender luxury hotels. Small modern bearing settled below the ledge, northeast from the city center, differs not at all from a Mediterranean resort: cafés, restaurants, ice-cream makers, bar serving cocktails, shops, etc. The site also includes a hammam on the west. Of the pier, we can see the Pigeons island and guess the marine caves of El Khalif. Museum of popular arts and traditions of Monastir: This museum displays traditional Tunisian costumes, most of which are wedding costumes, adornments, woven domestic items and copper objects. Islamic Arts Museum of Monastir‎: It contains a collection of early Arab coins, pottery, old maps and photos of Monastir. Leader Habib Bourguiba Museum: This museum is created after the 2011 revolution. It displays more than 1,360 objects, personal properties found in the presidential palace of Carthage, photo albums, sound recordings, archives, Rolls-Royce, bronze equestrian statue and gifts, all of the former president Habib Bourguiba. Moknine Museum: It is both an archeological and an ethnographical museum reflecting the past and the present of the town of Moknine and its region that for thousands of years have been rooted in the rich history of Tunisia. It displays ceramics, collection of bronze objects dating back to the 5th century, jewelry, costumes and distinctive features of this town. Lamta Archaeological Museum: The museum traces the origins of ancient Leptiminus, founded by sailors who came from Phoenicia around the 12th century BC. It presents all aspects of life: economic, social, cultural and religious, as well as different techniques at use during that period. The museum’s garden contains many vestiges, including in particular remains of imposing baths. You can discover the town (ribat, medina, marina, etc.) with family and friends, without producing CO2 and for health benefits. Whether it's to boost your fitness, health or bank balance, taking up cycling could be one of the best decisions you ever make, and everyone can develop circuits map at their own pace according to their tastes and abilities. You can also go around Monastir with the famous and traditional carriages and of course for a good price. It is a cheap and original mean to discover the city. During the conference, the touristic train will be used to move between the Monastir Sciences Palace and the faculties of dental medicine and pharmacy, where workshops will be held. The Palm Karting Monastir offers a great deal for those who are passionate of karting or those who want to try it. With its two circuits (adults and kids), we can organize karting group competitions for great prices. It also has a coffee shop, a great Mexican restaurant and a nice party space. Safety and security measures are paramount in events organized in Tunisia. Thus, fire extinguishers and first aid kits are required in public places. International events held in Tunisia are assisted with police presence as well as an ambulance in case of emergencies. In addition, Tunisians are known for their hospitality and good sense of humour which makes Tunisia one of the best Mediterranean travel destinations. Monastir's university attracts thousands of students from all over the country. In Monastir, there are 4 public dormitories that could be used for hosting Wikimania guests in addition to dozens of private cheap dormitories. Youth Complex of Ali Skhiri: Very clean hostel, with free wifi spots. The capacity of the complex is 32 people, and its restaurant capacity can reach 50 people. The price is less than 8 € per night. It is only 5 min by car from the Monastir Sciences Palace. The infrastructure of hotels is of a remarkable quality and continues to get even better. Classed hotels (from one to five stars) are beyond reproach for hygiene and facilities. Covered swimming pools, sporting facilities, mini-clubs for children and spa centres are very common. Costs of hotels in Monastir varies from 20 $ to 120 $ for a night. One of the best advantages of Monastir is that everything is so close. To ensure a good living condition to all our guests, we have chosen a conference place that is close to all needed facilities. Private and state hospitals are well equipped to ensure a high standard of health care if needed. Tunis–Carthage International Airport is the main airport of the country, used by more than a million passengers a year. It presents many facilities such as exchange offices that operate 24 hours a day, mobile hire services and a post office. The airport contains also several restaurants which serve various Tunisian delicacies. Getting access to Monastir is easy by bus, the Société de transport du Sahel bus station is located on the western edge of the medina. There is a bus every 20 minutes leaving from the station located in Bab El Bhar, Sousse, with lines 52A and 52B. You can reach also Monastir by another public transportation which is louage (collective taxi), the station being located next to the bus station. If choosing a louage at the Tunis station (Moncef Bey), you can arrive to Monastir within 3 hours. You can reach Monastir by train from Tunis. Trains leave the capital 3 times a day, at 8:30 AM, 1:35 PM and 5:50 PM. If you are in Sousse, there is the Sahel Metro from Sousse Bab Jedid station to Monastir Habib-Bourguiba station every half hour. Visitors to Tunisia must obtain a visa from one of the Tunisian diplomatic missions unless they come from one of the visa-exempted countries or are eligible for a visa delivered upon arrival. Citizens of other countries require a visa to enter the Tunisian territory. At this time, the Wikimedia community in Tunisia is not so big, so we are working to expand our activities through the help of non profit organizations like JCI ENIT and CLibre. Bidding to Wikimania would increase the number of active members and lead towards creating a Tunisian Wikimedia chapter. Preliminary meetings: agreements about the venue, listing of support entities, discussing the bidding process, etc. Experience in international events organization (World Social Forum 2013 in Tunis, JCI World Congress). This is the estimated budget for hosting the conference based on local experience of hosting conferences. We plan for every Tunisian dinar spent, and as stated above, we have many potential sponsors in our country. All amounts are in Tunisian dinars and United States dollar. Technical $ 31 500 50 000 TND A group of professionals in lighting and organizing events + expenditure related to wifi (we will try to get it as a part of the sponsorship from one of the local network operators). 30% of visitors could be vegetarian, to take that into consideration when contacting the catering service. This page was last edited on 14 November 2018, at 19:55.